The template represents a unique style, which is developed to provide you with fresh design solution for your agro website. What are the advantages? This template has a trendy large image background, which would make your agriculture look modern and attractive. 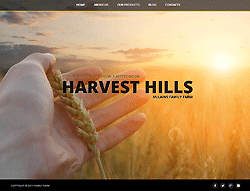 The pics of beautiful wheat fields are sliding to add to your website more dynamics. The other elements are rather minimal: the drop-down menu for comfortable navigation and social icons for auto-promotion. This template is at your service now.